The choice of "Hits from the American Songbook" as the title for this Thanksgiving weekend concert at Vancouver’s Opheum theatre with John Pizzarelli and Vancouver Symphony Orchestra was right on target. This remarkable collection of tunes written by the likes of Strayhorn, Kern, the Gershwins et al and known as the Great American Songbook has always had a special relationship with jazz. Since Pizzarelli and his trio last performed in Vancouver in January, last year, when they gave a Nat King Cole tribute show, Larry Fuller has replaced Ray Kennedy on piano. Fuller may not be as sparklingly improvisational as his predecessor, but nonetheless does bring to the unit a unique style nurtured from his time playing with Ray Brown. Younger brother Martin Pizzarelli and Tony Tedesco provide a solid anchor on stand-up bass and drums respectively. Led by the charismatic Pizzarelli, this complaisant quartet of jazz musicians are at the top of their game. Their repertoire, based on the American Songbook serves up laid-back interpretations of swing tunes and timeless jazz standards. Add to this a stellar orchestra, and all the pieces seemed to be in place for an evening of top-drawer entertainment. 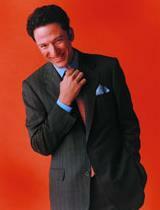 As a singer (John) Pizzarelli has the same pleasant crooning style as Harry Connick Jr. And though he may lack the vocal range of this talented artist, he interprets these well-known songs with eloquent expression. While the focus in the second half was on the music Harold Arlen, the fare presented by the Pizzarelli band in the first set was pretty eclectic, starting with a harmonious rendition of the Gershwin classic “They Can’t Take That Away from Me.” This was followed by the quartet’s temporary departure from the American Songbook repertoire with “Estaté” (Summer) sung in Italian. The VSO’s lush orchestrations, under the energetic direction of conductor, Ken Hsieh, generally blended well with the jazz quartet’s loose and improvisational style. The exception was every Sinatra wanna-be’s favourite karaoke song, “Witchcraft”, when the orchestra overwhelmed them with a wall-of-sound. The quartet closed out the first half with the instrumental “Honeysuckle Rose,” featuring Larry Fuller on solo piano. From start to finish, this was a performance that succeeded in every way, affirming the potent association between straight-up jazz and the Great American Songbook is ever-vibrant.